“How E-meter really works? I can not understand how…” and some confusion follows afterwards. Honestly speaking, for me it was also difficult to understand it from the studing materials and I could make sense of it only in the process of developing wireless iMeter. That’s why I decided to make a couple of pictures, which to my opinion can explain the e-meter working model more or less simply and clearly. TA values – are simply numbers shown on the Tone Arm switch, like 2.0 on Tone Arm (2.0 TA), 3.0 on Tone Arm (3.0 TA) and so on. Tone Arm itself is a variable resistance, which can change resistance when moved. TA numbers show the value of resistance Tone Arm has, when moved on some angle. It is shown on the picture how Tone Arm compensates the changing resistance of preclear, like balancing weights on the scales. The exact difference between PC resistance and Tone Arm resistance is shown by the needle on the e-meter scale. If the needle is in SET, PC resistance equals Tone Arm resistance exactly. If PC resistance is a bit bigger, then the needle moves to the left, if smaller – then to the right. This gives opportunity to see fast changes in PC resistance. As far as this resistance difference overcomes e-meter scale size, the needle stops at one of the scale ends. Then you have to tune Tone Arm to return the resistance difference on the scale. The next picture shows it a bit from another viewpoint. 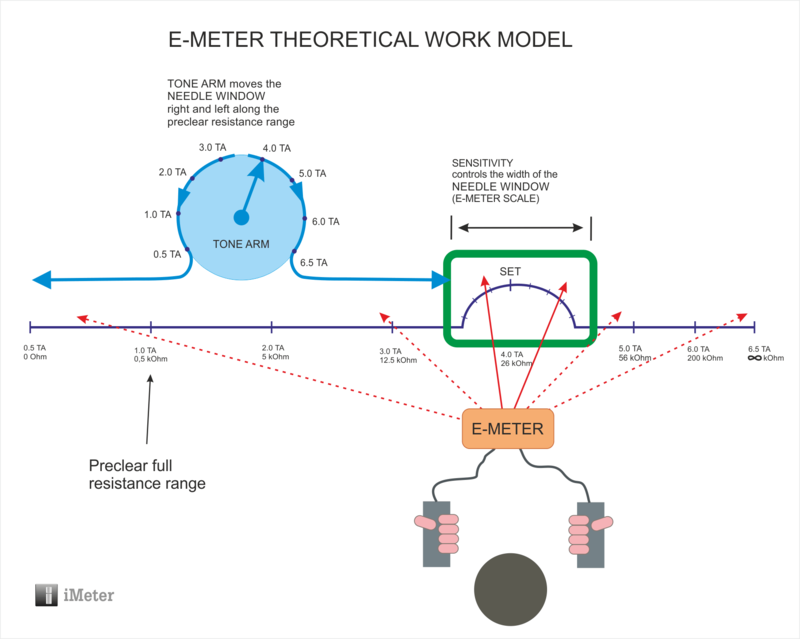 You can imagine that e-meter is measuring and indicates PC resistance somewhere on the whole range of human resistance. 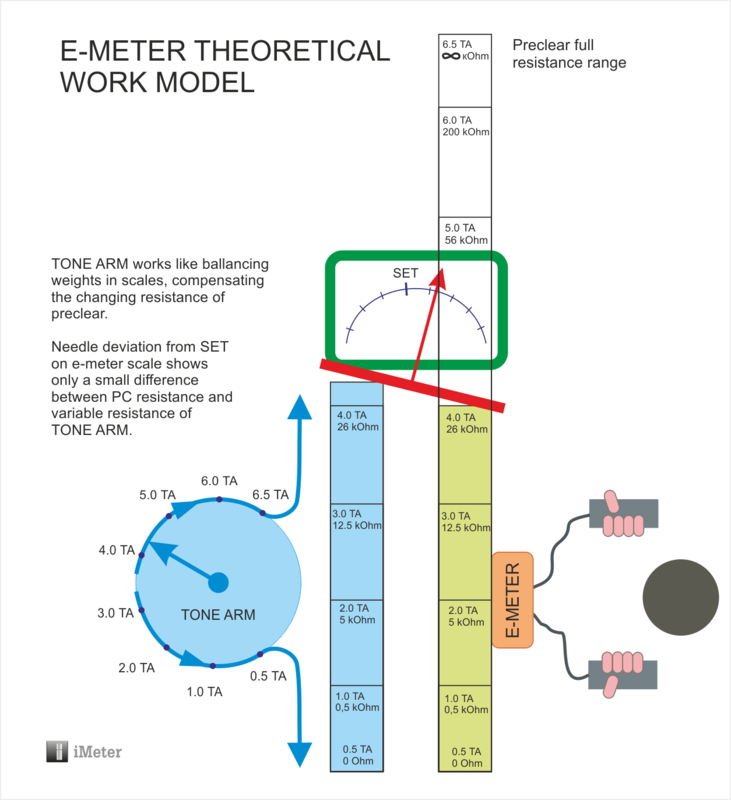 And Tone Arm only moves the needle window (e-meter scale with SET) along the range left and right to the point where PC resistance indicator is now, so that auditor could see the needle oscillations. You can also imagine that Sensitivity adjustment controls the width of this needle window. If needle oscillations are small, Sens can make the window smaller and so oscillations become bigger compared to the window, and will be shown full window (instead of small ticks) for better observations. And if oscillations are big, Sens widens the needle window, letting oscillations not to go over the scale ends. TA values shown on Tone Arm – TA – became very good measurement units of PC resistance for the needs of auditing. Usually resistance is measured in Ohms and kiloOhms (kOhm), but in auditing it is not very useful, because change of human resistance is not uniform along the resistance range. If PC resistance is small, its changes (readings) are also small – Ohms or tenths of Ohms, if PC resistance is big – it changes for hundreds and thousands of Ohms at once. So in order to unify these different sized readings, PC resistance is calculated not in Ohms but in TA. TA scale just flattens this differences of behavior on small and big resistance. So 1 TA contains different number of Ohms on every range of resistance: between 2 и 3 TA – only 7.5 kOhms, between 5 and 6 TA – 134 kOhms, and between 6 and 6.5 TA – hundreds of thousands and millions of Ohms. So, erasure of the same mental mass on different resistances of 2.5 and 4.5 TA, for example, will give resistance fall of 1.5 kOhms and 6 kOhms respectively, but in TA it will always be a fall of around 0,2 TA.